They know what kind of person they like or dislike. However, it does not mean the person they like is right for them. Three-time #1 bestselling author and relationship master, Hellen Chen, has helped many singles who had been skeptical about marriage, to find their true love and to walk down the aisle. With a principle that love is an "ability" which can be improved, Hellen travels the world to counsel singles and couples on what it takes to keep a relationship lasting and deep. Her popular Love Seminar will be coming to Los Angeles at the Hilton Hotel on May 23 Saturday. A redundant statement Chen has heard from men and women who were unhappy in their relationships, has been: "If only my partner can change for me..."
"Many singles think that their biggest problem is not being able to meet the right person. But the more precise reason is, they don't even know who is the right person." said Chen, "They know what kind of person they like or dislike. However, it does not mean the person they like is right for them." "Many men and women entered into marriage with the idea that they could change the behavior of their partner." Chen added, "That's wrongful thinking and the relationship often ends up in disaster." She encourages singles to not spend time, money and energy on dating but to look for someone who seriously wants to enter marriage. When asked about why dating a lot to find the right partner does not work, Chen explained in a recent Fox TV interview, "When people date a lot before they get married, their hearts get broken once too often and these bad experiences accumulate. These bad experiences even carry into the marriage and the moment they encounter seemingly insurmountable hardships in the relationship, they break-off easily as they think the next gal or guy would be better." According to Chen, a marriage is not about what one person could give to himself/herself, but a chance for himself/herself to learn how to give to another. 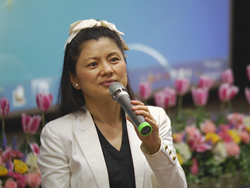 Believing that most individuals do want a loving relationship, Chen started lecturing and writing books about the subject. As a bestselling author, she has written 25 books and her book "The Matchmaker of the Century" and "Hellen Chen's Love Seminar" became number one bestsellers in relationship books at Barnes and Noble. Chen's works in family, marriage and personal developments are featured in over 200 media publications in 20 countries. She has been a frequent guest on independent and network radio and TV shows on FOX, CBS, NBC and ABC etc. To help singles and couples develop the ability to love, Chen has released a whole series of love workshops in Asia and in America. This upcoming event "Hellen Chen's Love Seminar" on Saturday, May 23 at Hilton Hotel in San Gabriel city is the 12th workshop Chen will be conducting in Los Angeles.